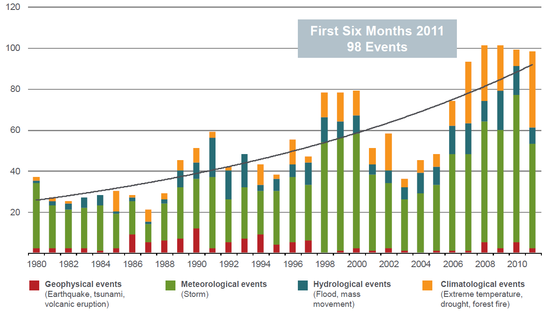 Increase in extreme meteorological and climate events in the U.S., 1980-2011. 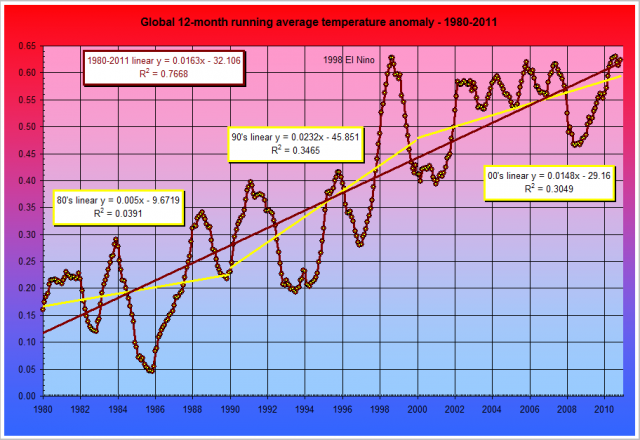 Increase in average global temperature, 1980-2010. Increase in global carbon emissions, 1980-2010. This entry was posted in Chart of the Day, Ecology on October 18, 2011 by Michael Happy. Spain’s Indignados have been protesting against the gloomy economic situation in which they find themselves since May. They have been joined by similar movements from New York to Sydney. The protesters’ preoccupations vary from place to place, as do the economic data that underpin them. Education is the focus in Chile, frustration with bankers in Britain. But they do share a common demand: someone, somewhere, should do something to right the problems of global capitalism as currently constituted. One reason why these protests are so interesting is that their targets, those cheerleaders for globalisation, capitalism and free markets, tend to agree that the system needs fixing. This makes the ‘occupy’ protests, as they have come to be known in the English-speaking world, hard to argue against. This entry was posted in Chart of the Day, Current Events on October 17, 2011 by Michael Happy. Occupy Toronto Canada begins today as part of what is now an international Day of Action. Above are more statistics to remind us what this is all about. Note that these data are four years old and before the crash of 2008. It’s worse now. 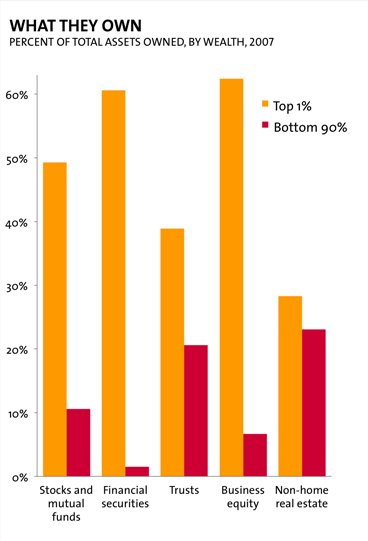 In what other context can 90% be characterized at the “bottom”? ➤ The World is dividing into two blocs – the Plutonomy and the rest. The U.S., UK, and Canada are the key Plutonomies – economies powered by the wealthy. Continental Europe (ex-Italy) and Japan are in the egalitarian bloc. ➤ Equity risk premium embedded in “global imbalances” are unwarranted. In plutonomies the rich absorb a disproportionate chunk of the economy and have a massive impact on reported aggregate numbers like savings rates, current account deficits, consumption levels, etc. This imbalance in inequality expresses itself in the standard scary “ global imbalances.” We worry less. Business Insider has produced an extraordinarily comprehensive narrative using charts to illustrate how we got here. I’d strongly recommend you have a look. I’d also like to note that the mindlessly repeated meme generated by the corporate media (Fox News in particular) that OWS is vague about its complaints and remedies is unfair. It is true that the movement is still evolving, but from the very beginning at least three identifiable problems and solutions have been repeated. 1. The banks are responsible for the collapse of the market three years ago and were subsequently bailed out with public money. They must therefore be taxed at higher rates, in order to refund the debt they owe (including hundreds of billions in quantitative easing), to make restitution for the tens of trillions of wealth they destroyed, and to decrease the worst income disparity in eighty years. 2. Because banks are responsible for the crash through demonstrably criminal activity, the perpetrators must be charged and tried. 3. Because the underlying cause of the crash is irresponsible government deregulation of the banking system, which was itself the result of relentless and remunerative corporate lobbying, the bond between government and corporate interests must be broken through legislation. The fact that these kinds of specifics aren’t good enough is yet another symptom of the narrative-driven, fact-deficient pack mentality that has dominated mainstream American “journalism” for decades. What has this to do with Canada, which has much stricter banking regulations and therefore, unlike Europe, did not find itself crippled as a result of the American banking crisis? First of all, it is in everybody’s interest that these issues be addressed. The corruption of the American banking system triggered a worldwide economic crisis that is far from being resolved — the euro, in fact, is still threatening to collapse, and with it would go the global economy. Secondly, the underlying issue of widening income inequality is universal, and, at the moment, is advancing in Canada at a rate faster than even the U.S. Canada has a corporate tax rate that is among the lowest of OECD countries, and that lower rate of corporate taxation drives steadily increasing income disparity. Canada is identified in the infamous Citigroup memo cited above as one of three fully developed plutonomies. We are not on the periphery here. We are at the very heart of the problem. This entry was posted in Chart of the Day, Current Events, Frye on Anarchism, Politics, Society on October 15, 2011 by Michael Happy. If Greece defaults, if the euro collapses, if the world spins into a second deep recession in just three years, these kinds of charts ought to be kept in mind. We have posted others here, here, here, here, here, here, here, and here. 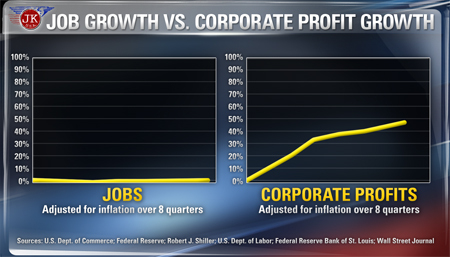 The poor and the middle class have been screwed to an almost unimaginable degree. Virtually every penny of profit across thirty years of increased productivity has gone to the top 10%, most especially the top 1%. These include the people who oversaw the crash of the financial market three years ago, destroying tens of millions of jobs and wiping out tens of trillions dollars of wealth. They then required a few trillion more in taxpayer-funded bailouts to keep the world’s financial system viable. Having secured that, they were very quickly once again giving themselves billions of dollars in bonuses and making record profits. But where are the new jobs? There are none because they evidently aren’t needed anymore, not in North America, and not at a decent working wage. The jobs at much lower wages have gone to places like India and China. This entry was posted in Chart of the Day, Current Events, Economics, Politics on September 15, 2011 by Michael Happy. A bigger, interactive version of the chart, as well as rankings, here. 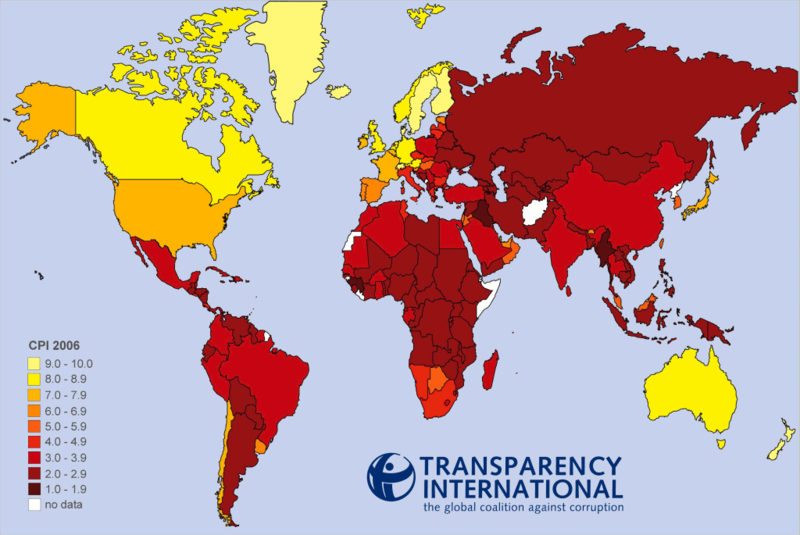 Denmark, New Zealand and Singapore are at the top of the clean list. Canada’s at number six. The U.S. is at number 22, just edging out Uruguay, France and Estonia. This entry was posted in Chart of the Day, Current Events on October 27, 2010 by Michael Happy.